An account of growing up nomadic, starry-eyed, and dirt poor in the ’60s and ’70s, by gossip journalist Walls (Dish, 2000). From her first memory, of catching fire while boiling hotdogs by herself in the trailer park her family was passing through, to her last glimpse of her mother, picking through a New York City Dumpster, Walls’s detached, direct, and unflinching account of her rags-to-riches life proves a troubling ride. Her parents, Rex Walls, from the poor mining town of Welch, West Virginia, and Rose Mary, a well-educated artist from Phoenix, love a good adventure and usually don’t take into account the care of the children who keep arriving—Lori, Jeannette, Brian, and Maureen—leaving them largely to fend for themselves. For entrepreneur and drinker Rex, “Doing the skedaddle” means getting out of town fast, pursued by creditors. Rex is a dreamer, and someday his gold-digging tool (the Prospector), or, better, his ingenious ideas for energy-efficiency, will fund the building of his desert dream house, the Glass Castle. But moving from Las Vegas to San Francisco to Nevada and back to rock-bottom Welch provides a precarious existence for the kids—on-and-off schooling, living with exposed wiring and no heat or plumbing, having little or nothing to eat. Protesting their paranoia toward authority and their insistence on “true values” for their children (“What doesn’t kill you will make you stronger,” chirps Mom), these parents have some dubious nurturing practices, such as teaching the children to con and shoplift. The deprivations do sharpen the wits of the children—leading to the family’s collective escape to New York City, where they all make good, even the parents, who are content to live homeless. The author’s tell-it-like-it-was memoir is moving because it’s unsentimental; she neither demonizes nor idealizes her parents, and there remains an admirable libertarian quality about them, though it justifiably elicits the children’s exasperation and disgust. 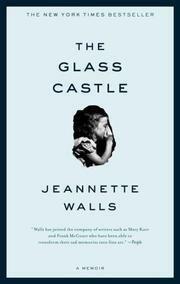 Walls’s journalistic bare-bones style makes for a chilling, wrenching, incredible testimony of childhood neglect. A pull-yourself-up-by-the-bootstraps, thoroughly American story.